US First Lady Melania Trump is on track to remain the most popular occupant of the White House. The mainstream media may rattle all they want about her husband, so far everyone agrees that FLOTUS hasn’t made a wrong step just yet. Related coverage: <a href="http://thegoldwater.com/news/38646-FLOTUS-On-To-Ghana-Malawi-Video"> FLOTUS On To Ghana, Malawi (Video)</a>. 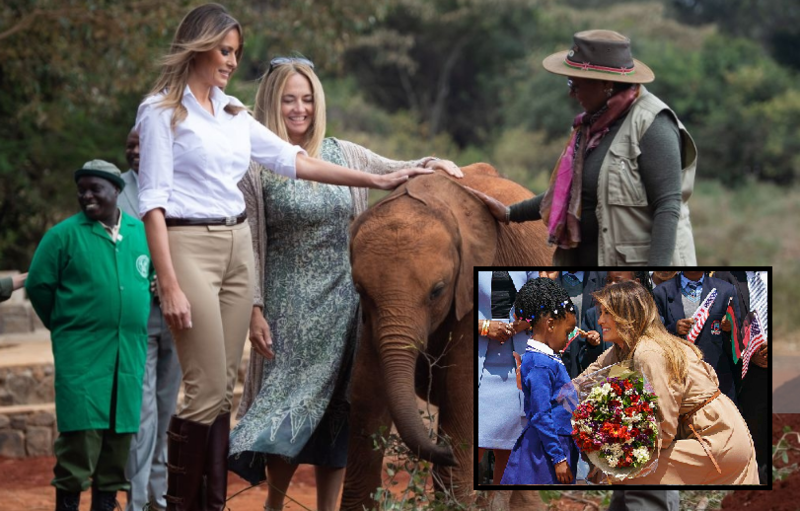 Today First Lady Melania Trump Friday joined her Kenyan counterpart Ms Margaret Kenyatta and could be spotted feeding a baby elephant at the David Sheldrick Wildlife Trust. She was interviewed by US media for a special which will air later today. After Kenya, the US First Lady will travel on to Egypt.